Lake Champlain (Plattsburgh Bay Region) in Clinton, NY - 3D Map 16 x 20 IN - Laser carved wood nautical chart and topographic depth map. Topsail Island in Onslow Pender, NC - 3D Map 16 x 20 IN - Laser carved wood nautical chart and topographic depth map. Destin Harbor in Okaloosa, FL - 3D Map 16 x 20 IN - Laser carved wood nautical chart and topographic depth map. White Rock Lake in Dallas, TX - 3D Map 16 x 20 IN - Laser carved wood nautical chart and topographic depth map. Coast of Maine (Lubec to York) in , ME - 3D Map 16 x 20 IN - Laser carved wood nautical chart and topographic depth map. 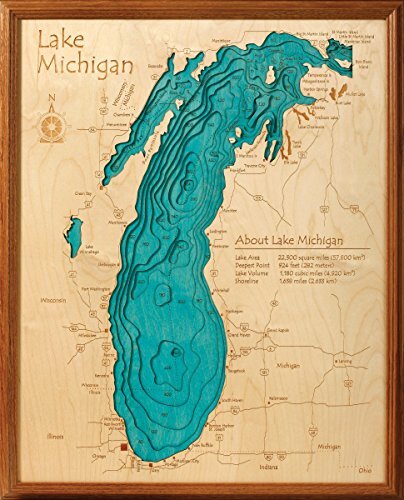 Lake Oakland (w Woodhull Lake) in Oakland, MI - 3D Map 16 x 20 IN - Laser carved wood nautical chart and topographic depth map. Battle Lake (East) in Otter Tail, MN - 3D Map 16 x 20 IN - Laser carved wood nautical chart and topographic depth map. Winnebago Chain in Calumet Fond du Lac etc, WI - 3D Map 16 x 20 IN - Laser carved wood nautical chart and topographic depth map. Drews Lake (Meduxnekeag Lake) in Aroostook, ME - 3D Map 16 x 20 IN - Laser carved wood nautical chart and topographic depth map. Tims Ford Lake in Franklin Moore, TN - 3D Map 16 x 20 IN - Laser carved wood nautical chart and topographic depth map. Lake Carroll in Carroll, IL - 3D Map 16 x 20 IN - Laser carved wood nautical chart and topographic depth map.